Formed into the shape of a dome this dessert or sweet confection is a popular Italian food item. Translated to mean "truffle" in Italian, a Tartufo may be made as a small chocolate candy with a sweet filling or it may be made as an ice cream dessert, typically filled with gelato and covered with chocolate on the outside. As the food has evolved, there are now a wide variety of different flavors made into the small confections produced as chocolate truffles with chopped nuts and other ingredients. 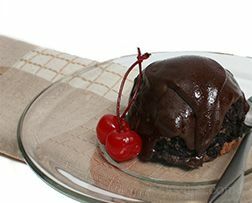 And in addition, the ice cream Tartufo has also become varied in the types of ingredients used to make the ice cream version. A Tartufo may also be referred to as Tartufi.